Is Israel’s airport security smart? 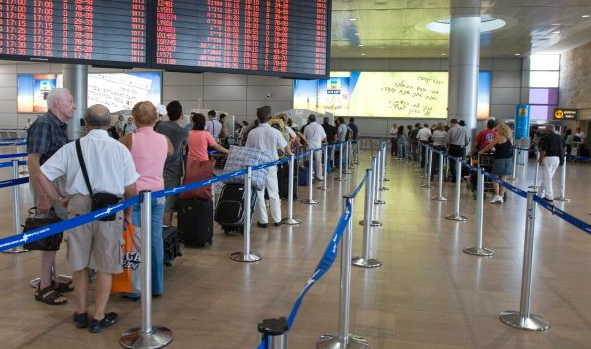 In the most recent development in the Israel-Turkey row, some Israelis have reported being subjected to humiliating searches and security questions after arriving in Turkey, supposedly as revenge for Israeli airport security practices. Regardless of whether or not this is the case, it serves as a good excuse to examine what exactly those practices are, and the degree to which they are as effective and unique as they are reputed to be. I must admit at the outset that I’m not a security expert, but sometimes outsiders can provide a different perspective. Since 9/11, airport security throughout the world has undergone a series of upgrades and changes. The phenomenon has been most visible at US airports, where security is run by the Transportation Security Administration (TSA). Founded in 2002, in response to 9/11, it has a budget of some $8 billion and employs 58,000 people. If you google “TSA learn from Israel” you’ll get around two million hits, of which thousands relate directly to the idea that the TSA could learn much by studying the “efficient” Israeli security model. Orli Gil, Israeli Consul General for the midwestern US, explained that the Israeli screening process relied heavily on interviews and other layers of security that aren’t as invasive as the infamous pat-downs the TSA are so fond of. The Israeli comparison to the perceived incompetence of TSA’s unhappy, underpaid security personnel has an allure. However, there are important questions that need to be asked about just how noninvasive Israeli security is. First of all, we can’t compare Israel’s single major airport, Ben Gurion, to the US’s plethora of airports, twelve of which each handle more passengers annually than Ben Gurion does. However, by just making a few comparisons, we can still come away with several conclusions. The average American TSA staffer is not as professional as his/her Israeli peer. Israeli security staff are usually young, educated and affable, while TSA employees are, for the most part, the opposite. The TSA people may have good intentions, but are hamstrung by strict rules that govern their behavior and rarely make independent decisions. That’s why there have been so many cases of TSA workers patting down six-year olds, for example. But the notion that Israel is doing something different is partly an illusion. From the point of view of catching terrorists, neither Israel nor the TSA has had much success. One could assume that the TSA and Israeli security keep the data secret, that they are in fact catching terrorists by the dozen, but the reality is more mundane. Airport security, generally, doesn’t catch terrorists in the act, yet the existence of security prevents terrorist attacks. If we look at the supposedly “smart” element of Israeli security that contrasts with the TSA there is also an illusion. Most commentators point out that Israeli security is better because it uses profiling. This is true – if you happen to fit Israel’s non-terrorists profile, that is. But this is just where Israel’s “smart” security falls on its face. Israel doesn’t actually profile terrorists – its security personnel simply categorize all Arabs and most other foreigners as requiring more intensive scrutiny. This was revealed in a March 2011 ruling by the Israeli supreme court, which demanded an explanation of why every Arab is labeled an automatic security threat. A 21-year-old Arab man flying alone seems to receive as much scrutiny as an extended Arab family with children and grandmas. Yet neither the two-year-old or 87-year old Arab woman fit a terrorist profile. Why do Arab women over 45 need to undergo a body search, when a TSA-style body scan would suffice? Why does an Arab woman wearing tight jeans and a halter top need a special search, when her body is in plain sight? Since a terrorist has never boarded a plane with his family, why body search a 50-year-old man flying with his wife and five children? Israel’s airport security does not release data on what percentage of Arabs are searched in this manner, or subjected to up to three hours of laborious, mundane, useless rifling through their bags, so we can’t know the actual figures, but from anecdotal evidence, interviews with Arabs and my own observations I would wager that it is in the neighborhood of 90-100 percent. This isn’t to argue that Israel’s security should be thrown out or that profiling should be abolished, but it is important to admit that the idea of Israel’s “smart” profiling is partly an illusion.